I continue to work on the new versions of The Retropolis Transit Authority and Saga Shirts. A lot of that work is behind the scenes, nuts and bolts stuff that you don’t want to know about but which, occasionally, is pretty clever; or so I tell myself. As time permits I’m also working up new versions of some of the T-Shirt designs. The newest of these is “I Still Want My Flying Car”. And no, sorry, I don’t want you to have a flying car; I’ve seen how you drive. 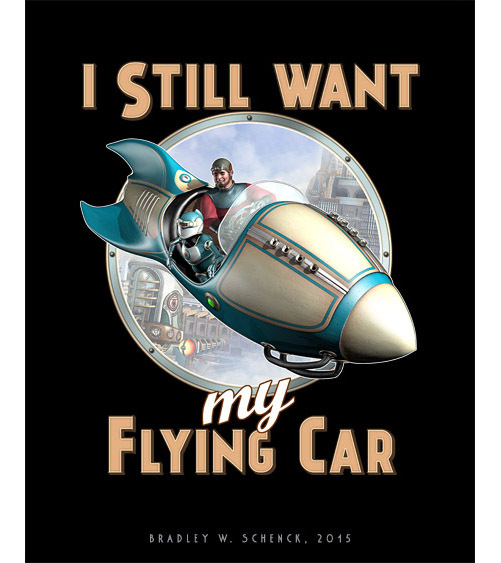 I want the only flying car, as you should, too. So the shirts are done; also the mugs, archival prints, posters, and mousepads. Some of those pretty clever, invisible things I’ve done are so far only happening at Saga Shirts. I don’t want to implement those changes at the Retropolis Transit Authority until I’ve finished about ten of the new shirt designs, which may take me awhile. But I have to wait on the last stage of my URL redirection until there are new pages to redirect to, for reasons that matter to me and the search engines… but probably not to you. After a surprise efficiency review the switchboard operators of Retropolis find themselves replaced by a mysterious system they don’t understand. So Nola Gardner pools their severance pay to hire Dash Kent, freelance adventurer and apartment manager, to find out what’s happened to their jobs. That ought to be easy for Dash, even if his practical experience is limited to heroic rescues (of what he calls entities) from the priests of the Spider God, in their temple at Marius Crater. But the replacement switchboard is only one element of a plan concocted by an insane civil engineer: a plan so vast that it reaches from Retropolis to the Moon. 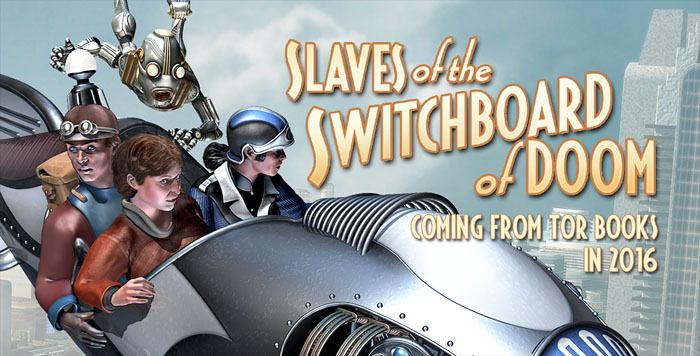 Dash and Nola race to find the hidden switchboard and solve the mystery, and they think they’re on their own. Of course they’ve got no idea how this plot has affected the Fraternal League of Robotic Persons, or the Ferriss Moto-Man Company, or even those infernal children from the third floor. And while everyone scrambles to save their jobs – or their freedom – the world’s smallest giant robot is striding toward its destiny. An inch or two at a time. Retropolis has found ways to contain its abundance of Mad Science. But in Slaves of the Switchboard of Doom we find that when engineers go mad. . . they know how to build madness on a scale that’s never been seen before. 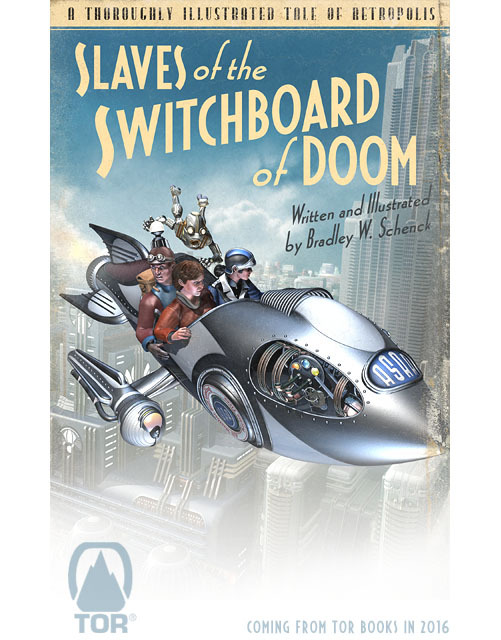 My illustrated book Slaves of the Switchboard of Doom has been acquired by Tor Books for publication late in 2016. I’ve been trying to find a home for the book for more than a year, but let’s face it: everybody at Tor may have been drunk at the time, and now they’re just too polite to tell me so. Still a big win, right? For the (very) long version, click on through to the rest of this post. If you’re going to be the Worlds Greatest Anything… my advice? Shoot for the stars. Go for WORLDS GREATEST MEGALOMANIAC. I told you this week about my all-new incarnation of the Retropolis Transit Authority. But I didn’t tell you everything. When I remade the Transit Authority shirts for their new vendor, I left fourteen of them out. They were old designs, or designs I thought should be better, and the plan is that over time I’ll either do them over or retire them permanently. This is the first of those new versions. Now, The WORLDS GREATEST MEGALOMANIAC is unique in the store. While I was writing The Lair of the Clockwork Book I invented a coffee mug with that slogan on it. 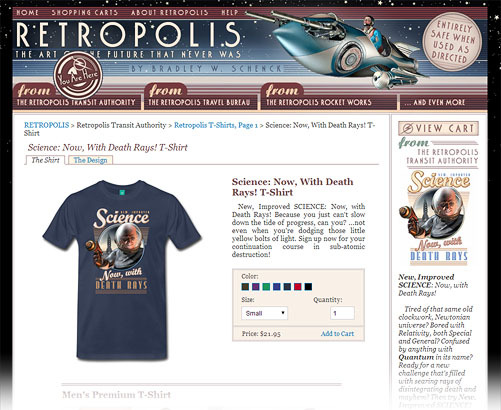 And once I’d invented it, I could see that it needed to exist: so I made one, and I made shirts to match. Today we have a new, improved Megalomaniac – and, come to think of it, NEW, IMPROVED MEGALOMANIAC! has potential, too. Let me get back to you on that one. We’re all about experimentation, here in the Secret Laboratory, and as always you’re invited into the Vivisectorium for a personal tour. 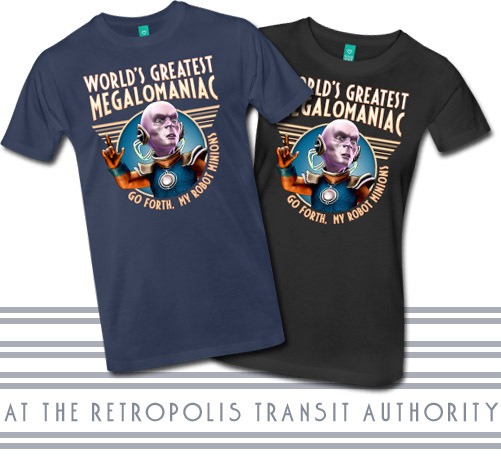 This week’s experiment is an all new incarnation of The Retropolis Transit Authority with T-Shirts now printed by Spreadshirt. I gave this a go once I’d rebuilt the Pulp-O-Mizer’s T-Shirt system; building a new storefront was actually less work even though (for the first time) I wrote the complete store management system myself. Don’t get me started on pagination! We should consider this a shakedown cruise. But, happily, the shirts are now less expensive. And that’s always nice, even during a shakedown.